Hortus Camdenensis | Cordyline australis Hook.f. Half hardy, erect, palm-like tree, branching sparingly, with arching, green to yellow-green, lance-shaped leaves, to 90cm long, and broad panicles, 1m or more long, of tiny, creamy-white flowers in summer, followed by white or blue-tinted berries. To 10m. [RHSE, Hortus, Hilliers']. Introduced to Britain in 1823. [JD]. GC p.792/1860. ‘The history of the New Zealand and Australian Cordylines was long in a state of great confusion, which I attempted to clear up in the' Gardeners' Chronicle' in 1860. 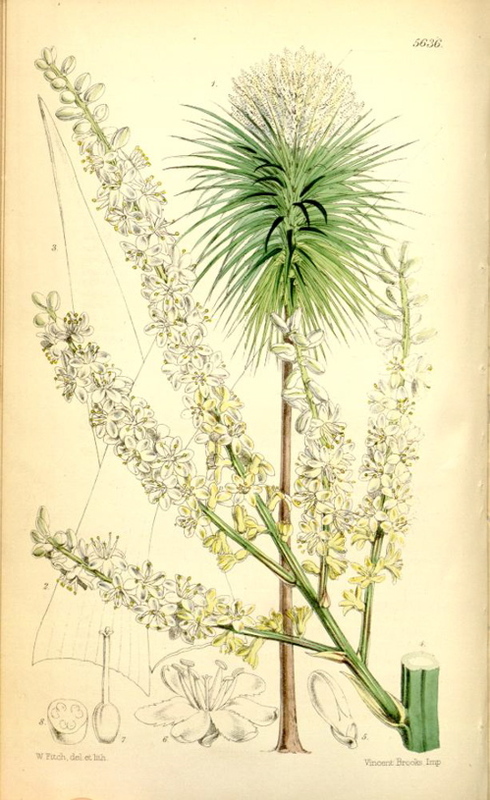 I then showed that the Dracaena australis of Forster, which was undeterminable from that author's description, was, according to the figure in the Banksian Herbarium, not the plant so cited in this Magazine (Tab. 2835). I also showed that the Magazine plant, which was sent from the Sydney Botanical Garden, was most probably procured from Norfolk Island, whence I have dried specimens collected by A. Cunningham, so long the Superintendent of the Sydney Gardens. I have now the pleasure of figuring what I believe to be the true Dracaena australis of New Zealand, the commonest of four or six species that inhabit that group of islands, and a plant which could not well have escaped Forster's notice. It is a very handsome small tree, almost hardy in the west of England, quite so in the Scilly Islands, where Mr. Augustus Smith has flowered fine specimens in the open air. It often passed for C. indivisa in the nurseries, but that, as is now well known, is a totally different plant, with a much broader, yellow-green, strongly-veined leaf, and a drooping panicle of much larger flowers. The plant from which the accompanying drawing was made, flowered in the temperate house at Kew, in June, 1866.’ [BM t.5636/1867]. Listed under the name Charlwoodii australis [T.308/1843] in all published catalogues. Charlwoodia australis G.Don is a recognised synonym for the New Zealand cabbage palm so we can be quite confident this plant was grown in the gardens at this time. We cannot be certain that the plant listed as Dracaena australis in the catalogues is Cordyline australis Hook.f. or Cordyline baueri Hook.f. (which see). The New Zealand cabbage palm is possible but Cordyline baueri cannot be ruled out, particularly in light of Macarthur’s association with the King family and hence Norfolk Island. Cordylines are placed in Agavaceae in the Hortus, following the classification system of the Hortus Kewensis. Some authors place them in Asparagaceae, Laxmanniaceae or Lomandraceae while the Flora of New South Wales places them in Asteliaceae.